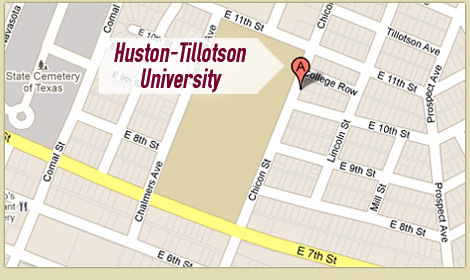 AUSTIN — Each day that passes, Huston-Tillotson University (HT) gets closer to one of many milestones to come, an expanded Center for Entrepreneurship and Innovation (CEI). This fall (official date to be announced), located at the Center for Social Innovation (CSI) on Springdale Road in East Austin, HT’s Center for Entrepreneurship will make dreams of starting a new business come true for more women and minority students and the community at large through education and partnerships. “We are going to make some millionaires out there!” said an excited Dr. Steven Edmond, Dean of the School for Business and Technology. In March 2018, HT announced its plans to expand to an off-campus site to speed up its “intellectual heartbeat” in East Austin in the area of entrepreneurship. President and CEO Dr. Colette Pierce Burnette noted that the Center for Social Innovation campus is an ideal location for the HT Center for Entrepreneurship and Innovation. Currently, the Center is located in a small room on the first floor of the Agard-Lovinggood Building at HT’s main campus, 900 Chicon Street. The new 6,600-square-foot building will be just five minutes from HT’s main campus and 10 minutes from downtown Austin. Just as Dr. Burnette repeatedly states, “Austin is a magical place,” the magic is happening every day as business startups pop up in numbers all over town. Now, HT will have an even bigger hand in helping those startup numbers grow faster. The most recent updates on the progress include gifts to ease the costs associated with the relocation and naming of a director to lead the Center. One of the early gifts included a $15,000 check from Frost Bank. Another gift came recently; it was an almost $100,000 gift of furniture to the Center. The Bread of Life, a Houston, Texas non-profit, generously donated more than 350 pieces of office furniture to the School of Business and Technology’s Center for Entrepreneurship and Innovation. The gift of furniture, estimated to be worth nearly $100,000, became a reality when the Community Development and Social Responsibility unit of Texas Capital Bank introduced the CEO of the Bread of Life to Dr. Edmond; Texas Capital Bank is an HT corporate partner. Founded in 1992, the Bread of Life began modestly by serving impoverished persons one hot meal weekly. That charitable act grew to serving 500 meals per day to the homeless from the sanctuary of St. John’s Methodist Church in Houston. Over the decades since its founding, Bread of Life has helped to improve the charitable landscape of Downtown Houston by providing an array of services to families in peril and homeless individuals. The Bread of Life receives new and gently-used furniture donations from corporate clients of Fannie Mae, a United States government-sponsored mortgage loan company. Fannie Mae donates the furniture to avoid excessive landfill waste. In turn, the Bread of Life accepts the furniture and recycles it to non-profit organizations in the Houston community. Dr. Hector Gomez MacFarland has been appointed the director of the new Center for Entrepreneurship and Innovation. MacFarland, currently serving as a marketing faculty member in the School of Business and Technology, will be tasked with carrying out the mission of CEI, which again is to provide women and minorities with transformative experiences through entrepreneurship and innovation. MacFarland will serve as the primary point of contact and lead for all activities of CEI. He will work closely with Dr. Edmond to cultivate long-term relationships and to develop and deliver various entrepreneurial activities as well as manage the business incubator. MacFarland received his doctorate from Tulane University in New Orleans, Louisiana. For nearly 15 years, he has taught marketing and entrepreneurship courses at the university level, both in Mexico and in the U.S. In Mexico, MacFarland co-founded IDZ Technologies (Internet of Things solutions provider). When MacFarland relocated to Austin twelve years ago, he continued to oversee that company as well as others while honing his business startup skills with the Austin Technology Incubator; this is the startup incubator of the University of Texas at Austin’s IC² Institute. For more updates as the Center’s opening nears and for even more HT news, connect with HT on its social media channels, Facebook, Twitter, and Instagram. For quick access to these channels, the channels appear at the bottom of HT’s homepage at htu.edu.